With the spring, comes new life at the Arsenal on the Charles West Garage project. The project has shifted into a new gear, away from major excavation activities and focusing on new foundations and walls. We have seen a dramatic decrease in truck traffic on the roads carrying material away from the site, and now we have trucks delivering the concrete for the foundations. As everyone has enjoyed a mild winter, the project too has benefited with little to no schedule impact through the few storms that New England had to bear. The project schedule is still on track with an expected completion in early 2018. Be sure to check our the dashboard on the main Construction Page for up to date progress updates. Looking ahead to Spring and early Summer 2017, we will be completing concrete work and getting ready to receive the precast concrete panels that are connected together to build the structure. The current expectation for this is early May. We are working with Town and State officials to gain the necessary permits and approvals for this trucking and the routes that are expected to follow. 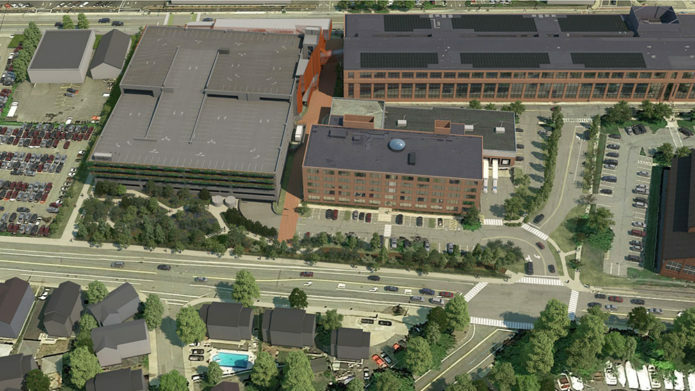 This rendering shows a birds eye view at North Beacon Street, looking at the new garage and pocket park along the sidewalk. The intersection of North Beacon Street, School Street, and Charles River Road will adjust the campus' south-entrance traffic flow, where drivers will be guided into the garage through the parking lot adjacent to Building 39.